Sometimes things just come together, but there is always a sartorial derivative when it comes to putting together an outfit. The aim of this feature is to document such events. Vain? Absolutely. Lately, I’ve been kind of obsessed with John Dillinger and the wild outlaws of the early thirties (despite the deep disappointment I felt after watching the insultingly bad Public Enemies). Naturally, a major way in which my interests manifest is through clothing. So behold, Episode 1 of The Germinal Wardrobe. *Note: The amazing blog Nerd Boyfriend takes this concept and really runs with it. Check it out. This summer, you should be advised that every moment you will have in the sun will be better if accompanied by The Hollwood Sessions. The two go together like coffee and cigarettes. I’ve done my best to heed this advise, and I feel like an infinitely better person for it. In that spirit, I thought I’d share a tragically heroic story from these recordings… however exaggerated and blurred through time it may be. Two weeks following his 1946 Cocoa Sessions in New York, Bird and Dizzy Gillespie made a fateful visit to California to record for Dial – the trip would ultimately last two years. At the time Bird was drinking heavily and overindulging his addiction to heroin, and the time spent in California only escalated his problems. The tapes documenting the stint are all incredible, but most notable is the “Lover Man” session. Apparently on this night, Bird hadn’t scored before entering the studio, and was suffering from withdrawals; so painful that he had to be physically held up to the microphone stand. Charles Mingus considered the “Lover Man” from this session to be one the most poignant pieces of music ever recorded. Legend has it that later that night, after drinking in his hotel room, Bird set his bed ablaze with a cigarette and stumbled into the lobby clad only in his socks. He was arrested and committed to Camarillo State Mental Hospital, the location that inspired the classic “Relaxin’ at Camarillo,” where he remained for six months. Moral: I think in an eloquent way, these sessions document the raw and emotional effects of substance abuse on creative inertia, for better or worse. A truly serendipitous moment is captured in the photo above, which portrays Lincoln’s funeral procession as it passed the (Cornelius) Roosevelt Mansion at the SW corner 14th Street and Broadway. Cornelius Roosevelt (January 30, 1794 – July 17, 1871) was a New York businessman, and the grandfather of Teddy Roosevelt, who owned and lived in the building pictured to the left of the center in the photo. As it turns out, this photo displays a 6-year-old Teddy and his brother Elliott (the father of Eleanor Roosevelt), peering out the second story window of the Roosevelt Mansion onto the procession. See ’em? If not, click here for a more illustrative photo. It’s just incredible that this moment in American history was actually caught on film, and I love when distinct eras of history collide unknowingly – this is a perfect example, kind of like a real life Jetsons Meet The Flintstones. I took these on a new camera, a Taron Marquis, which is a Japanese camera from 1962. 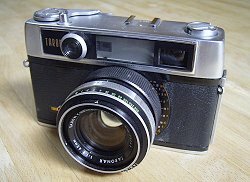 According to the Japanese Camera Museum, the Taron Marquis (also sold as the Rival Rangefinder outside of Japan) was the world’s first 35mm camera with a built-in CdS sensor (Cadmium Sulfide).